Here is a dream I had 7 years ago, around the time Oprah’s last show was airing. During that period of my life I was having plenty of what I started to refer to as my Oprah Dreams, that’s why this one was titled Another Oprah Dream. This one in particular, illustrates how we use repetition in our dreams. In this dream I am coming out of someone’s home on a family, residential street. It’s a crescent and Oprah’s house is in that crescent. Or I could say that it’s a “dead end street”…..and Oprah’s house is at the dead end….except to add that the homes are in a crescent. I’m out on the street walking to a place where I am going to speak. Oprah’s door opens and she comes out. I walk up her stairs to greet her. 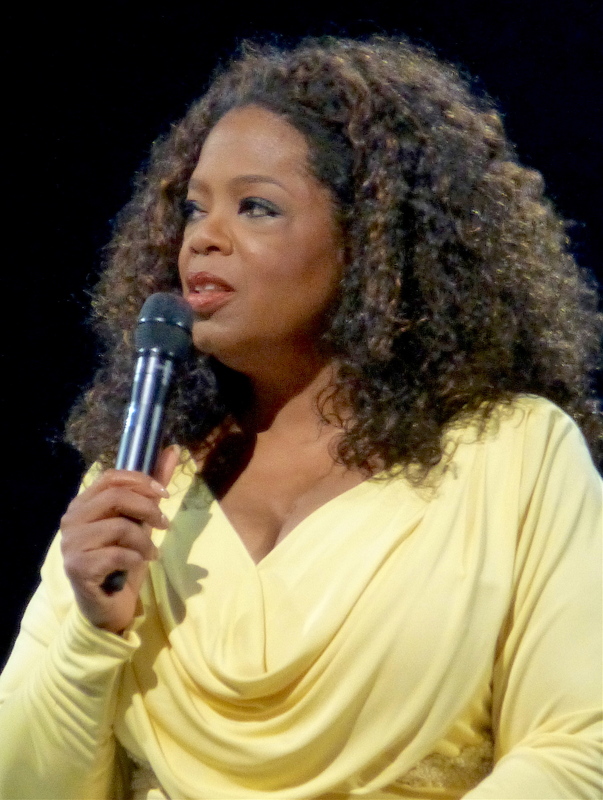 Since Oprah had, at the time, frequented my dreams, it was like we are friends, but not close enough that I felt completely relaxed and comfortable. There was a small tension there. We came down the stairs together. Next we were in the room where I was giving the presentation. There is a room in the center of this big room. There’s a table that covers the room all around, and you can walk all around as well, but you can’t walk from one side to the other if you are in the middle of the room. The table that covers the circumference of the room has a white tablecloth. People are sitting all around and there is plenty of room for me to walk all around though I am thinking it is going to be a challenge for everyone to hear me. Oprah is sitting on the left side of the room right in the middle. A few people are up and getting coffee still, but I begin. At first I’m standing on Oprah’s side of the room, but in the far left corner, and as I begin to talk I realize I should walk around to each of the corners of the room to make sure everyone hears me. I’m not giving my usual lecture. Instead I go right into examples of dreams. For example, I remember saying to one woman, “Did you know one client had a one-picture dream of a piglet stuck to her breast?” And then I told why she had the dream. Sure enough, hands went up all over the place. I chose a woman who was in the far right-hand corner of the room. She stood up to speak as I am walking towards her and she said her dream in French. Not only in French, which most of the people in the room don’t understand, but also, she has no mic. I had to repeat what she was saying and I also now had to translate. This was the part of the dream where I took the reigns and felt very comfortable and at ease with myself. I took to walking the room. I never crossed completely over to the right side to walk that length of the room probably because the dreamer was on the left side and I was talking with her, but I did make it to all corners projecting myself very well so that everyone in the room heard what I was saying. She would talk and I would repeat what she said in English and then respond to her in French asking her questions, and then repeat in English so everyone understood what I asked and what she was responding. It was a challenge but I did very well. I was managing “as if” I was completely comfortable but inside I have to admit there was a certain tension definitely different than speaking with a mike at the front of a room in a traditional way. The night before the dream I watched my TIVO of Oprah’s last show. At the time I had been trying to get on her show. If I was shutting my chances down of such a hope, that’s the dead end. Yet in the dream her house sits on a crescent. It’s not like your typical dead end street where there are houses on both sides and nothingness down the center. This metaphor symbolizes how there are other ways more “round about” in which a person can still be approaching Oprah even though her show is over. For example she was still running her magazine and of course, her network. The dream reflects how I was being heard in a more “round about” way than I would have on Oprah’s show. It provides the roundabout in a repeat. One created by the crescent and then the idea repeats itself in the room I am speaking in by me having to walk around in order to reach the participants. The “different than traditional way” that appears in the dream repeats itself as well. One is in how I walk around the room to present as opposed to speaking to a room full of people with me standing at the front. A second repeat of the concept of “different than” happens in how typically my lecture begins by me teaching the how-to of decoding the dream and then using the dreams of people in the room to further illustrate my method. In this dream, though, I go straight to a participant’s dream. Dream first. Theory later. Finally, when Oprah doesn’t share her dream with me, it reflects how I didn’t (yet anyways) get all I would have liked. In the dream I carry on very well regardless….which is exactly what I was doing at the time….in my own “round about” way. During that final Oprah Show I watched before I had this dream, one of the points Oprah brought across, (which I have known all along, yet hit me a certain way that time), is that each of us has a passion. We are all here to give something special to the world. She said that when you find your passion, do it! You may not be able to do your passion for a living, but make time to do it anyway. What she said rang true for me. Even after 45 years I am still just as passionate, excited, and in awe about how much information we can gather from our unconscious mind every night. I had wished for the opportunity to get the news out to a wide audience as a guest on her show, but it never came to pass. While I hadn’t reached a huge mass of people to tell them the news about the value of dream analysis, I had published my first book and people were hearing me when I did guest spots on radio and TV shows. I was also invited to speak at schools and spas and was getting myself known on social media, etc. Back to the heart of Oprah’s point, I internalized that I don’t have to reach the size of audience I would have liked to. The truth is I love dream analysis. Nothing gives me the big charge I get watching (or hearing) a dreamer catch the meaning of the dream. Here was Oprah’s message again, coming at me from the universe a second time in two days…..And the dream? It’s the third time! Yes. I think I got it. I had that dream in 2011. Here we are in 2018. I just released a two-book set called Have A Great Dream, Book 1; The Overview, Decoding Your Dreams To Discover Your Full Potential, together with the work I did back in 2002, now a second edition, this time titled Have A Great Dream, Book2; A Deeper Discussion. I am back into promotion-mode, doing 45 radio shows over the coming few months, and a Full Day Workshop coming up at New York Open Center on October 28, 2018. Will I finally reach a wide audience to tell about propelling your problem solving and other incredible benefits of dream analysis? We shall see…but we know for sure I am having a terrific time while I wait and see. Come and join me for the workshop in New York. I would love to meet you!